It might be surprising to know that Punk is very popular especially in the underground scene among young males. Their corrupt government disillusions some Indonesian youth, they show their rebellious nature through the anger of punk music and style of dressing including the ripped jeans, piercing, dyed hair etc. Punk in Indonesia has actually kept its original ideology, that is none commercial, anti authoritarian scene. These kids on the street live communal; survive by busking with their ukuleles. As the Sukarno nationalist era ended in 1965, people felt human rights violations even in the era of Sukarno under a socialist government and military rules. From 1965 onwards, when Suharto successfully assumed control in the military after government generals and military leaders either dead or missing. The communal hatred had that built up from the civilians especially the youth, in result there were lots of riot going on. The new order Suharto gave more freedom to the youth to create new music and express themselves as they realized that there is something wrong with their government, they started expressing themselves through music in relation to the political and social issues. The student to express their unhappiness towards the government, students either disappeared or put in jail. Some independent punk band existed in the era criticize social and political problem. The youngest song of Sukarno created a band wrote a song 1973 malaria using symbolism so that the government don’t understand the idiom. The metaphor is that the people are small like mosquitos, although powerless but have a lot of potential like malarias mosquitos, which can cause a lot of death. Mike Marjinal, the president of the marjinal punk group currently, says the group associate punk as the desire of freedom, the desire to be who you want to be. He says that people till now are still discriminated by the way they dress. 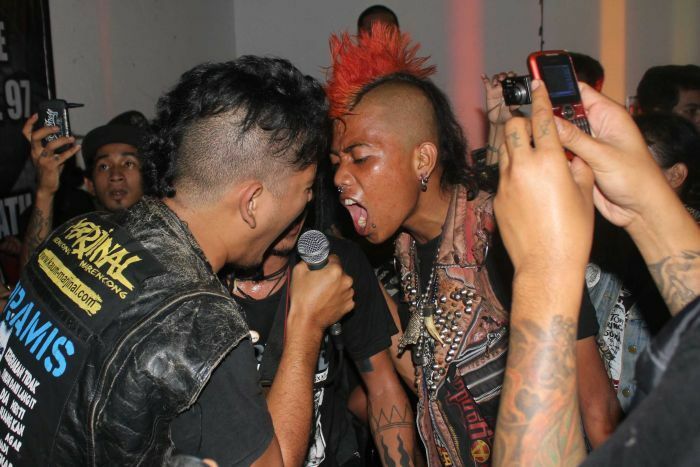 In December 2011, a punk rock concert has been broken up as the police in Indonesia caught 65 Indonesian youth. They stripped away body piercing and then thrown them in pools of water for “spiritual” cleansing. On the other hand the police chief express his side by saying, we are not torturing or violating human rights, we are putting these youth back on the right moral path. It just shows that the civilians have no human and how strong the military force is in this country. Here in Indonesia, adultery is punished by stoning to death and gay people are put in jail or lashed in pubic with rattan canes. It is not surprising that people are unhappy with their government especially considering the western influence. Perhaps Punk is just a conceptual act of wishful thinking, pushing the boundary of reality and fiction, desire for freedom and a better world. Inside Indonesia, (2015). The killings of 1965-66 – Inside Indonesia. [online] Available at: http://www.insideindonesia.org/the-killings-of-1965-66 [Accessed 1 May 2015]. Radio National, (2014). Search for the Kuda. [online] Available at: http://www.abc.net.au/radionational/programs/hindsight/kuda/4408130 [Accessed 1 May 2015]. the Guardian, (2011). 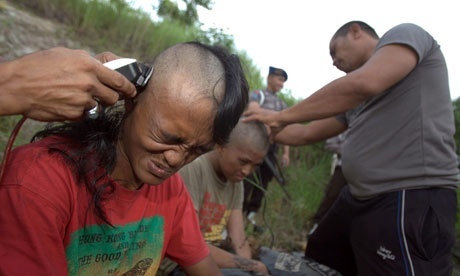 Indonesian punks detained and shaved by police. [online] Available at: http://www.theguardian.com/world/2011/dec/14/indonesian-punks-detained-shaved-police [Accessed 1 May 2015]. Hindsight – art, anak punk, and the power of dissent. (2013). [podcast] Available at: http://mpegmedia.abc.net.au/rn/podcast/2012/12/hht_20121209_1305.mp3 [Accessed 1 May 2015]. 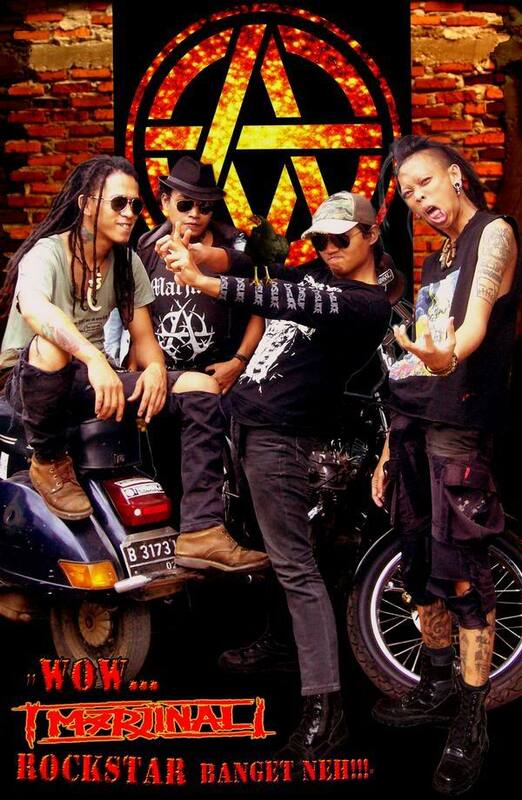 < Previous Post D – Indonesian Punk – Punk’s Not Dead!